Opened in 2008, Commons exemplifies Bates Dining’s commitment to sustainability. Among its many “green” features, it makes good use of natural light to save on electricity. Photograph by Phyllis Graber Jensen/Bates College. For Bates College’s Dining Services, the answer to Irving Berlin’s musical question is 65 steps. Bates Dining, which in 2002 was the first food-service operation in higher education to join the Green Restaurant Association, recently earned a third star for its Green Restaurant sustainability rating from the GRA. The improved rating, the GRA’s second-highest, puts Bates into rarefied company. Only five other U.S. colleges or universities boast three-star ratings, and Bates is the only such Maine institution. Long recognized for its sustainable practices, Bates implemented 65 action steps to become greener still and earn the third star. Those steps covered the waterfront in terms of both function and scope, ranging from the use of water-saving faucet aerators to the high proportion of vegan and vegetarian items in Bates’ food purchases. “We’re ecstatic” about the increased rating, says Cheryl Lacey, director of Bates Dining Services. 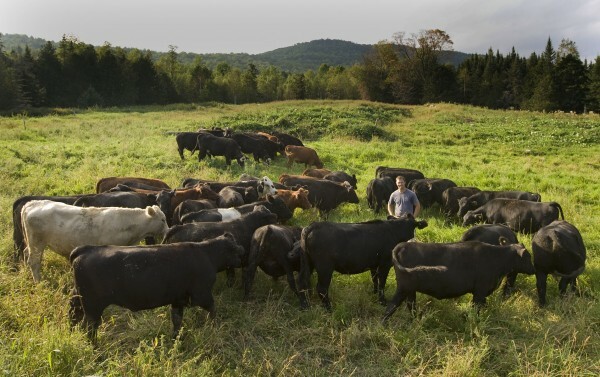 “I think we have a true commitment to sustainability. In certifying commercial and institutional dining operations, the GRA rigorously verifies that its member institutions are doing what they claim. The GRA awards points for sustainable steps in seven categories: energy, food, water, waste, disposables, chemicals and pollution reduction, and buildings. With 175 as the minimum score for the three-star rating, Bates earned 212.68 points. Especially point-worthy action items were the vegan-vegetarian food purchases (separate items totaling 30.75 points), the use of renewable energy sources (20 points) and composting (totaling 35 points). See a breakdown of Bates Dining’s GRA point score. GRA consultants were especially impressed by Bates’ use of electric vehicles and by the engagement of a certified-green pest-control firm, Kennebunkport-based Atlantic Pest Solutions. A napkin-holder card from the PAWS campaign against wasting food. For instance, last November a student group played a key role in encouraging students to take only as much food as they can eat. In its successful campaign in Commons, the Personal Awareness, Wellness and Social Happiness Committee (PAWS) suggested ways for students to form new habits. 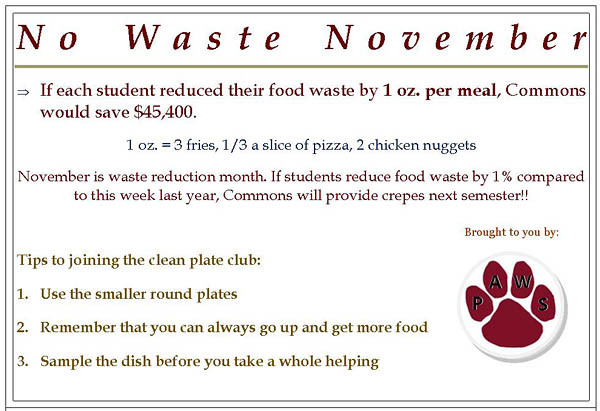 They offered an eye-opening statistic: If every student took one ounce less food than usual — about the equivalent of three french fries — Dining Services would save $45,400 annually, or 77 percent of Bates’ comprehensive fee for one student for 2013-14. 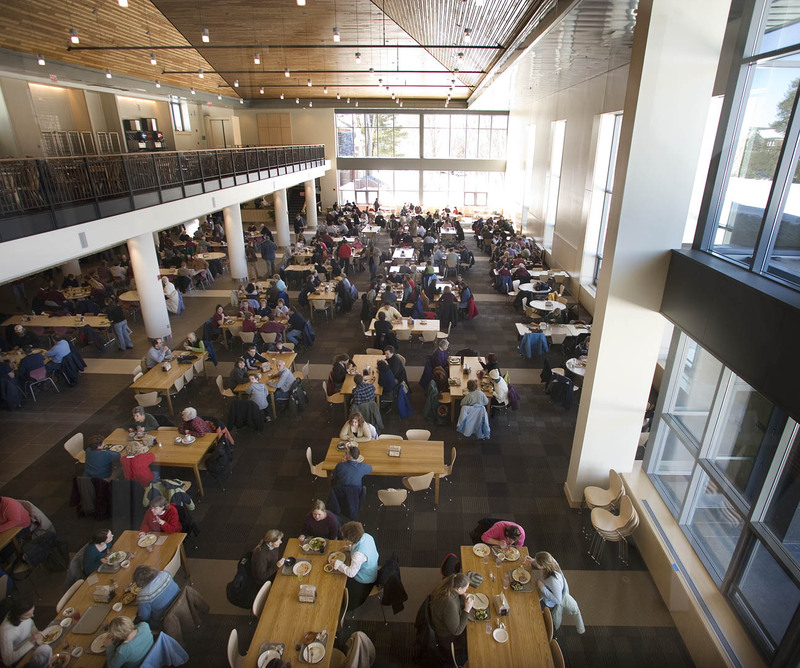 Opened in 2008, the college’s Commons building embodies Bates’ sustainable philosophy. It employs all manner of energy- and water-saving technologies, was designed to accommodate robust waste-reduction practices and even boasts a dining hall ceiling made out of wood recycled from an old Thomas Edison phonograph factory. The U.S. Environmental Protection Agency and ReNew America are among national institutions that have honored Bates Dining for its green practices. In addition to Harvard and BU, the other schools operating three-star GRA food services are Kent Career Technical Center in Grand Rapids, Mich.; Northeastern University, Boston; and the University of Minnesota (Minnesota Landscape Arboretum). All told, 124 discrete food-service facilities, including restaurants and institutional facilities, received three stars. Seventeen facilities were awarded four stars. Founded in 1990, the Green Restaurant Association has worked to provide convenient and cost-effective tools to help the restaurant industry reduce its harmful impact on the environment. The GRA founded the green restaurant movement and is one of the pioneering founders of the green business movement as well. Learn more.